The first trailer for Disney's Frozen finds the reindeer Sven (Tom Kane) and snowman Olaf (Josh Gad) engaged in a playful snow battle. Along with this look at the animated adventure, Disney has confirmed two more casting additions, with Alan Tudyk and Santino Fontana joining Josh Gad, Kristen Bell, Idina Menzel and Jonathan Groff for the ensemble voice cast. Take a look at this festive winter-laden footage, then read on to find out more about Walt Disney Pictures latest animated adventure centering on two friends who try to save their village from an icy curse. Walt Disney Animation Studios (WDAS) has tapped a trio of talented actors to join the voice cast in Frozen. Josh Gad (The Internship, Love and Other Drugs, Broadway's "The Book of Mormon") provides the voice of Olaf the snowman; Santino Fontana (Broadway's "Cinderella," "Brighton Beach Memoirs," "Billy Elliot") lends his vocal talents as Hans; and Alan Tudyk (42, Wreck-It Ralph, ABC's Suburgatory) joins the film as the voice of the Duke of Weselton. The talented group of actors joins Kristen Bell, Idina Menzel and Jonathan Groff in the epic adventure, directed by Chris Buck (Tarzan, Surf's Up) and Jennifer Lee (screenwriter, Wreck-It Ralph), and produced by Peter Del Vecho (Winnie the Pooh, The Princess and the Frog). Frozen is slated for the big screen Nov. 27, 2013, and will be presented in 3D in select theaters. Gad brings his sense of humor and his incomparable personality to Olaf, a fun and lively snowman who joins Anna and Kristoff on their journey to save the kingdom. The film, TV and stage star is a veteran of the famed Groundlings Improv troupe and founder of The Lost Nomads Comedy Troupe. He appears alongside Vince Vaughn and Owen Wilson in The Internship, and has a guest-starring role in Fox's New Girl. Upcoming roles include the biopic jOBS, in which he stars as Apple co-creator Steve Wozniak. Gad's credits also include Thanks for Sharing, Love and Other Drugs, The Daily Show, The Rocker, 21 and Crossing Over. He starred in Broadway's "Book of Mormon," for which he was nominated for a Tony. Gad's Broadway credits also include "The 25th Annual Putnam County Spelling Bee." 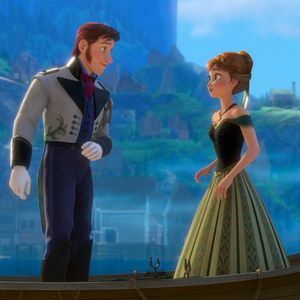 Fontana provides the voice of Anna's handsome suitor Hans, who steps in to govern Arendelle when Anna takes off to find her sister. The actor was seen on Broadway as Prince Charming in Rodgers and Hammerstein's "Cinderella," for which he received a Tony nomination. His other Broadway credits include "The Importance of Being Earnest," "Brighton Beach Memoirs," "Billy Elliot" and "Sunday in the Park with George." Fontana also starred in 2011's off-Broadway play "Sons of the Prophet." He's received Drama Desk, Lortel, Obie and Clarence Derwent Awards. On TV, Fontana has appeared on The Good Wife, Royal Pains, A Gifted Man and Made in Jersey. Tudyk, who gives voice to a prominent duke visiting Arendelle for a coronation ceremony, returns to the WDAS recording studio following an Annie Award-winning performance as the voice of King Candy in Wreck-It Ralph. A veteran of the big and small screens, Tudyk stars in the critically-acclaimed ABC comedy Suburgatory. He can be seen in 42 as Ben Chapman, manager of the 1947 Philadelphia Phillies and one of Jackie Robinson's most vocal antagonists. Tudyk also appears in Arrested Development. His other credits include Firefly, 28 Days, A Knight's Tale, Death at a Funeral, Dodgeball: A True Underdog Story, Knocked Up and 3:10 to Yuma. Tudyk lent his vocal talents to a host of animated films, including three of the Ice Age films and Alvin and the Chipmunks: Chip-Wrecked, as well as Robot Chicken and Family Guy. On Broadway, he starred in "Epic Proportions," "Spamalot" and "Prelude to a Kiss." Walt Disney Animation Studios, the studio behind Tangled and Wreck-It Ralph, presents Frozen, a stunning big-screen comedy adventure. Fearless optimist Anna (voice of Kristen Bell) sets off on an epic journey-teaming up with rugged mountain man Kristoff (voice of Jonathan Groff) and his loyal reindeer Sven-to find her sister Elsa (voice of Idina Menzel), whose icy powers have trapped the kingdom of Arendelle in eternal winter. Encountering Everest-like conditions, mystical trolls and a hilarious snowman named Olaf, Anna and Kristoff battle the elements in a race to save the kingdom. The film is directed by Chris Buck (Tarzan, Surf's Up) and Jennifer Lee (screenwriter, Wreck-It Ralph), and produced by Peter Del Vecho (Winnie the Pooh, The Princess and the Frog). Featuring music from Tony winner Robert Lopez ("The Book of Mormon," "Avenue Q") and Kristen Anderson-Lopez ("In Transit"), Frozen is in theaters in 3D on November 27, 2013. For more information, check out Disney.com/Frozen, like us on Facebook: Facebook.com/DisneyFrozen and follow us on Twitter: @DisneyAnimation.